The oldest undisputed examples of figurative art are known from Europe and from Sulawesi, Indonesia, dated about 35,000 years old (Art of the Upper Paleolithic). Together with religion and other cultural universals of contemporary human societies, the emergence of figurative art is a necessary attribute of full behavioral modernity. There are, however, some examples of non-figurative designs which somewhat predate the Upper Paleolithic, beginning about 70,000 years ago (MIS 4). These include the earliest of the Iberian cave paintings, including a hand stencil at the Cave of Maltravieso, a simple linear design, and red paint applied to speleothems, dated to at least 64,000 years ago and as such attributable to Neanderthals. Similarly, the Blombos Cave of South Africa yielded some stones with engraved grid or cross-hatch patterns, dated to some 70,000 years ago. Uranium-thorium dating of painted designs in the caves of La Pasiega (Cantabria), a hand stencil in Maltravieso (Extremadura), and red-painted speleothems in Ardales (Andalusia) yielded an age of more than 64,800 years, predating the previously oldest known art by at least 20,000 years. The Mask of La Roche-Cotard has also been argued as being evidence of Neanderthal figurative art, although in a period post-dating their contact with Homo sapiens. The "Divje Babe flute" had controversially been claimed as a Neanderthal musical instrument; other archaeologists have claimed a Cro-Magnon origin of the artefact. A number of rival archaeologists maintain an alternative hypothesis that the perfectly circular, spaced, and aligned holes were bite marks of carnivores. The main argument in support of their alternative hypothesis is fundamentally circular in its reasoning: that the artefact which appears to be a flute of Neanderthal origin cannot be a flute of Neanderthal origin because Neanderthals did not have music, according to them. In 2002 in Blombos cave, situated in South Africa, ochre stones were discovered engraved with grid or cross-hatch patterns, dated to some 70,000 years ago. This suggested to some researchers that early Homo sapiens were capable of abstraction and production of abstract art or symbolic art. Also discovered at the Blombos cave were shell beads, also dating to c. 70,000 years ago. Engraved ochre has also been reported from other Middle Stone Age sites, such as Klein Kliphuis, Wonderwerk Cave and Klasies River Cave 1. Arguably, these engraved pieces of ochre represent – together with the engraved ostrich egg shells from Diepkloof – the earliest forms of abstract representation and conventional design tradition hitherto recorded. The interpretation of the hatching patterns as "symbolic" has been challenged, and several purely functional explanations of the objects have been proposed, e.g. as an ingredient in mastic, skin protection against sun or insects, as soft-hammers for delicate knapping, as a hide preservative or as medicine. Claims of artistic activity, in the form of diagonal etchings made with a sharks tooth, were made in 2014 relating to a 500,000-year-old fossil of a clam found in Java in the 1890s associated with Homo erectus. Homo erectus had long before produced seemingly aimless patterns on artifacts such as is those found at Bilzingsleben in Thuringia. Some have attempted to interpret these as a precursor to art, allegedly revealing the intent of the maker to decorate and fashion. 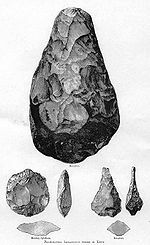 The symmetry and attention given to the shape of a tool has led authors to controversially argue Acheulean hand axes as artistic expressions. There are several other claims of Lower Paleolithic art, namely the "Venus of Tan-Tan" (before 300 kya) and the "Venus of Berekhat Ram" (250 kya). Both of these may be natural rock formations with an incidental likeness to the human form, but some scholars have suggested that they exhibit traces of pigments or carving intended to further accentuate the human-like form. ^ M. Aubert et al., "Pleistocene cave art from Sulawesi, Indonesia", Nature volume 514, pages 223–227 (09 October 2014). "using uranium-series dating of coralloid speleothems directly associated with 12 human hand stencils and two figurative animal depictions from seven cave sites in the Maros karsts of Sulawesi, we show that rock art traditions on this Indonesian island are at least compatible in age with the oldest European art. The earliest dated image from Maros, with a minimum age of 39.9 kyr, is now the oldest known hand stencil in the world. In addition, a painting of a babirusa ('pig-deer') made at least 35.4 kyr ago is among the earliest dated figurative depictions worldwide, if not the earliest one. Among the implications, it can now be demonstrated that humans were producing rock art by ∼40 kyr ago at opposite ends of the Pleistocene Eurasian world." ^ a b D. L. Hoffmann; C. D. Standish; M. García-Diez; P. B. Pettitt; J. A. Milton; J. Zilhão; J. J. Alcolea-González; P. Cantalejo-Duarte; H. Collado; R. de Balbín; M. Lorblanchet; J. Ramos-Muñoz; G.-Ch. Weniger; A. W. G. Pike (2018). "U-Th dating of carbonate crusts reveals Neandertal origin of Iberian cave art". Science. 359 (6378): 912–915. doi:10.1126/science.aap7778. "we present dating results for three sites in Spain that show that cave art emerged in Iberia substantially earlier than previously thought. Uranium-thorium (U-Th) dates on carbonate crusts overlying paintings provide minimum ages for a red linear motif in La Pasiega (Cantabria), a hand stencil in Maltravieso (Extremadura), and red-painted speleothems in Ardales (Andalucía). Collectively, these results show that cave art in Iberia is older than 64.8 thousand years (ka). This cave art is the earliest dated so far and predates, by at least 20 ka, the arrival of modern humans in Europe, which implies Neandertal authorship." ^ a b St. Fleur, Nicholas (12 September 2018). "Oldest Known Drawing by Human Hands Discovered in South African Cave". The New York Times. Retrieved 15 September 2018. ^ d'Errico, Francesco, García Moreno, Renata & Rifkin, Riaan F. (2012) Technological, elemental and colorimetric analysis of an engraved ochre fragment from the Middle Stone Age levels of Klasies River Cave 1, South Africa. Journal of Archaeological Science, 39, 942-952. ^ Lombard, M. (2006) Direct evidence for the use of ochre in the hafting technology of Middle Stone Age tools from Sibudu Cave. Southern African Humanities, 18, 57–67. Lombard, M. (2007) The gripping nature of ochre: The association of ochre with Howiesons Poort adhesives and Later Stone Age mastics from South Africa. Journal of Human Evolution, 53, 406-419. ^ Wadley, Lyn, Hodgskiss, Tamaryn & Grant, Michael (2009) Implications for complex cognition from the hafting of tools with compound adhesives in the Middle Stone Age, South Africa. Proceedings of the National Academy of Sciences.